Please note that menu items and prices may vary according to location. All items are available for dine in or take out. Menu prices are subject to change without notice. Specials menus augment evening and weekend offerings. 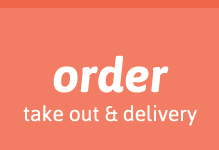 If you’d like to place a to-go order on-line, contact our friends at waiter.com. Note: Design changes frequently as the menu doubles as a coloring sheet. Note: Cupertino, an independent franchise, doesn’t utilize this menu.